The ultimate purpose of getting a video file is to play it. When you play MPEG on iOS or Android devices, what you get is simply failure. That's because MPEG files are incompatible with most mobile devices (including some game consoles). So, if you wanna watch MPEG files on your smartphone or tablet on the metro or train back home, you're supposed to convert MPEG to MP4, one of the most widely used video format. Speaking of transcoding MPEG files to MP4, you need MP4 converter first. And there are dozens of choices available. Among them, some are charging software while others are 100% freeware. Any difference? The biggest one I guess might be the single function and functional diversity. If you need more features after conversion and expense means nothing to you, the MP4 video converter shareware suits your taste. Well, if you just need to convert MPEG videos to MP4 and have no other demands, basically, a free MPEG to MP4 converter is enough. 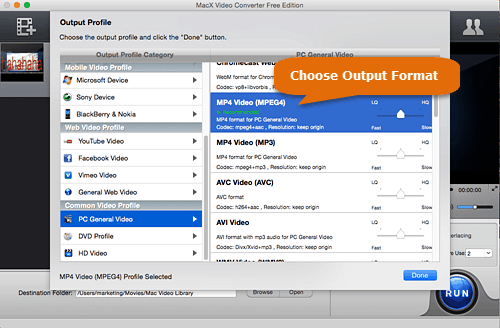 MacX Video Converter Free - decode video from .MPEG to .MP4 like a Ninja! 1). 1-click to free convert MPEG files to MP4 on Mac/PC at 5X faster speed. 3). Free convert 4k to 1080p, MKV to MP4, AVI to iPad, HEVC to H264, etc. 4). Video editor (trim/crop/rotate) & video compressor (up to 90% reduction). 100% FREE transcode videos from MPEG format to MP4 on Mac/Windows PC at full speed (multi-core CPU (up to 8) utility and hyper-threading tech). This free MP4 video converter is armed with De-interlacing and High Quality Engine to ensure you an output MP4 file with 98% quality reserved. Remove unwanted video clips from MPEG file, crop black borders from video image, adjust video resolution (4K to 1080p), lower video Bit rate 20%-50% to compress file size, up to 90% size reduction if MPEG file is too large for your devices. Support you to free convert any other SD, HD or UHD videos like MKV to MP4, AVI to MP4, WMV to MP4, AVI to H264, MPEG to MPEG-4, MP4 to MP3, H265 to H264, YouTube to MP4, etc. 180+ video and 14+ audio formats. Free download the freeware on Windows (10) or download Mac version on Macbook/iMac (macOS High Sierra). Add video via "Add Video" button or just drag and drop MPEG files into this program (batch conversion is supported). Choose MP4 (H264) from "Mac General Video" or iPhone 7/Plus MP4 (H264) under "Apple Device" profile if you need to play MPEG on iPhone. As you see, there are also some other mobile device profiles like Android, Microsoft, Sony, Blackberry & Nokia, etc. you can choose if you need. 1. Tap the scissor-shaped icon and you can further edit MPEG files like cut off unwanted video clips from video, crop video to remove black borders, add SRT subtitles to MP4, merge MPEG files into one, rotate video 90/180/270 degrees, etc. 2. Click "Settings" option on the main window, then you're able to adjust MPEG video parameters, including adjust 4K 2160p to 1080p, lower bit rate, change frame rate, change aspect ratio 4:3 to 16:9 or vice versa, etc. Hit "RUN" button to start to encode or decode MPEG videos to MP4 for free on Mac/Windows. The conversion speed is decided on the duration of your file, your computer hardware configuration and this software acceleration engine. You always have more than one option. 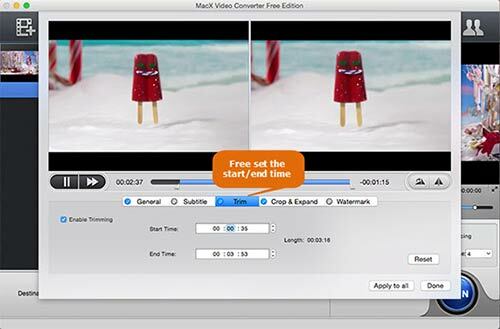 The same is to free video converter for Mac/PC. On top of the above-mentioned MacX Video Converter Free, there are another two great open source video converters called Handbrake and VLC player. They are both free, cross-platform and outstanding in many fields. Handbrake is the leading open source freeware to free convert video on Mac/Windows (MPEG to MP4 included), but also to free rip DVD disc on computer under the help of third party software. VLC is world-renowned as a media player. But it doesn't end here. It can also play the role as a free video converter to free convert MPEG to MP4, as well. Since these three video converter freeware all work amazing in MPEG/MPG to MP4 conversion, which one should you prefer? Calm down, here we compare them to let you have an overall impression about them and afterwards you make your own decision. MPEG is developed by Moving Picture Experts Group. MPEG video is usually using MPEG-1 or MPEG-2 compression. MPEG-1 is used in Video Compact Discs (VCDs) and its brother MPEG-2 is used for DVDs with higher quality. MPEG can be accepted by limited video players like Microsoft Windows Media Player, QuickTime. MP4 is developed by Moving Picture Experts Group, as well. MP4 is a video container format, compressed with MPEG-4 (or H264) video encoding and AAC audio compression. MP4 can store digital video, audio file, subtitles, still images and other data. MP4 can be compatible with almost any mobile device, video player, game console, etc. Free download the best free video converter to decode and encode video, free convert video from MPEG/MPG to MP4, as well as MKV to MP4, AVI to MP4, AVCHD to iPad, YouTube to MP3, etc. Also a good video editor and video compressor to free trim/crop/rotate video, add subtitles to video, adjust video resolution, frame rate, bitrate, aspect ratio, etc. to balance quality and file size. On the Contrary: Free Convert MP4 to MPEG? Same Steps?